For LaJuana Clark, Samaritan Inns is a return home. Not just as a symbol of hope for continuing her sobriety, but as a return to the Columbia Heights neighborhood she called home since she was a child. “I learned how to roller skate. I learned how to play basketball on those courts on Fairmont,” she recalls. Although the neighborhood faced serious drug and violence related issues, she felt protected, because everyone knew and respected her family. But, like the neighborhood, her family was dysfunctional. Her brothers used. Her parents fought. Everyone drank. Despite this, her mother instilled in them a lot of good morals and values. “She said to us, when we went out, we would represent her, no matter what;” words that stuck with her throughout her life. At this point, most would view LaJuana as a “functioning alcoholic.” She had a good job and a nice place to stay. However, that came crashing down. While LaJuana was in-between jobs, her ex kicked her out. “She sent me an email telling me to get out,” LaJuana revealed. She never experienced homelessness before and admitted that she believed many of the negative stereotypes that stigmatize homeless individuals. But now, it was real. 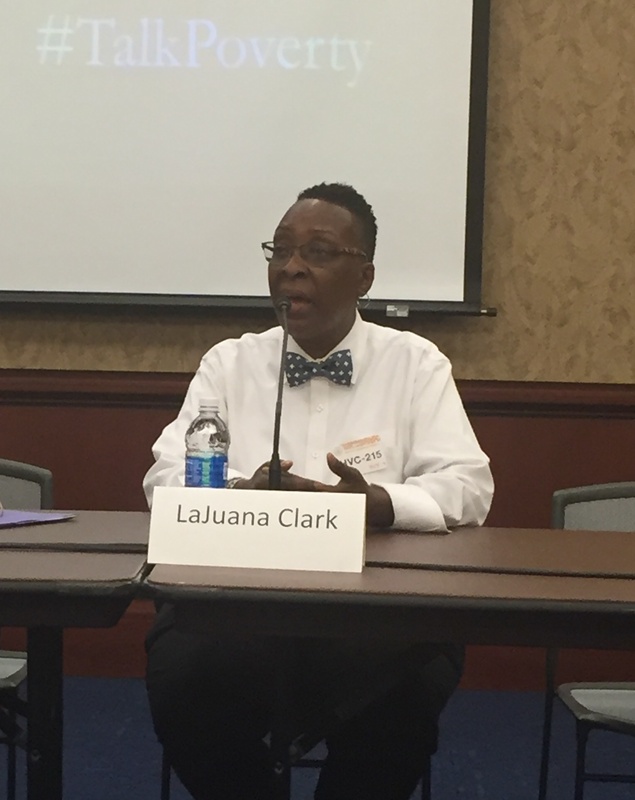 LaJuana personally experienced the everyday struggles and challenges of homelessness. After three days, she was able to get into a shelter. 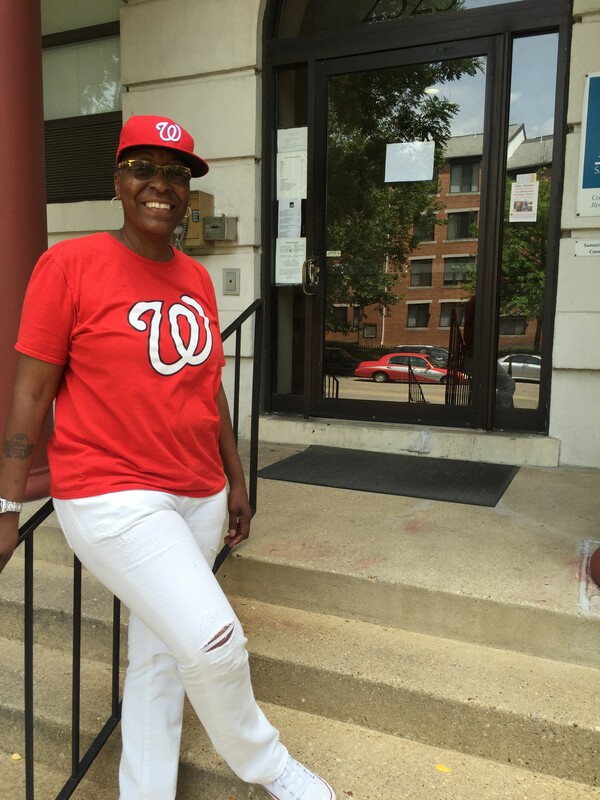 After about a month, she was admitted to N Street Village, where she found longer-term housing, a security job, and a path to sobriety. Unfortunately, even as she got clean, this did not come without obstacles. Last year, shortly after securing an apartment, her job started garnishing her checks and cut her hours. Finances dried up quickly. She turned to several programs but they were unable to help. Her landlord evicted her, leaving her possessions on the street. Friends came and helped pick up her belongings and gave her a place to stay until she could find another home. That’s when LaJuana moved to Samaritan Inns and found a secure and affordable environment for her that allows her to continue her sobriety and pursue her dreams. “I love staying here. I wouldn’t change nothing,” she remarked. LaJuana is currently pursuing a degree in Network Systems Administration. She is an honor student but this does not come without its challenges, nor without her hard work and dedication. “I failed 2 classes 2 times. My graduation date changed. But it’s not stopping me.” After she graduates, she is pursuing a Bachelor’s Degree in Cyber Security. “I’ve been doing security all my life, so now, I’ll go to the IT side,” she explained. This lack of fear enables LaJuana to chase all of her dreams. Not only is LaJuana excelling at school and work, she’s become a passionate advocate and performer, speaking out on behalf of the homeless on WPFW and MSNBC, for the Washington Interfaith Network, and on the Hill. LaJuana recently appeared in the documentary, “How I Got Over”, where she shares her story of recovery and triumph at The Kennedy Center. Never satisfied, LaJuana continues to push the boundaries of what is possible for her life. “My dream is to go on The Voice or Sunday’s Best. I got bets on The Voice. I want Pharrell to help me out.” She shared how she wants to come back to Samaritan Inns and talk to people and share her story to help them find the strength to make it through as well. In November of this year, LaJuana will celebrate 5 years of sobriety. “I look back and say, ‘We did this God.’” Samaritan Inns is proud to host the homecoming and continuing sobriety of LaJuana.